9 February 2016. A team of engineers and medical researchers in Australia show it’s possible to safely implant electrodes in the brain to transmit brain activity with a catheter-delivered stent. A description of the device and delivery process with sheep appears in yesterday’s (8 February) issue of the journal Nature Biotechnology (paid subscription required). 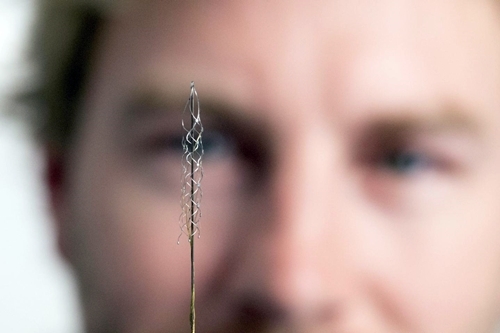 The device, called a stentrode, is the invention of neurology research fellow Thomas Oxley and post-doctoral researcher Nicholas Opie, in the Vascular Bionics Laboratory at University of Melbourne. The device is planned for testing next year in human clinical trials to send instructions with thoughts to move robotic exoskeletons. Oxley and Opie also filed for a patent in the U.S. and started a company called SmartStent to commercialize the technology. Neurosurgeons today can directly implant electrodes into the brain, but that requires sensitive and invasive surgery, with added risks of adverse reactions, such as inflammation and fibrosis. The Melbourne researchers are seeking a safer method of implanting brain electrodes, and adapted the process of inserting cardiac devices by sending the electrode through a vein with a stent, a tiny wire basket that fits through veins, but later expands. In a visit to the U.S. in 2011, Oxley called on the Defense Advanced Research Projects Agency, or Darpa, part of Department of Defense, to discuss his idea, and received from Darpa a $1 million grant to get the project off the ground. Australian health and scientific agencies added another $2.2 million. Oxley and Opie designed the stentrode to be inserted with a stent that fits through and resides inside a vein in the brain. The stent is made of nitinol, a nickel-titanium alloy containing the electrodes, shaped like a basket about the size of a match stick. Once inserted with a catheter in a vein, the stentrode is directed to a vein adjacent to the brain’s motor cortex that controls voluntary muscular movements in the body. The electrodes are attached to ultra-thin wires that run through the vein to a wireless transmitter in the chest. The journal paper reports on tests of the device and the implantation process with sheep. The Melbourne team reports the sheep were able to move around freely with the implanted stentrodes for 28 days, with the researchers able to record brain activity during that time. In addition, the signal quality of the transmissions from stentrodes was similar to electrodes directly implanted in several other sheep. The researchers say this proof-of-concept study shows the stentrode can transmit motor signals from brain, which can then be directed to robotic exoskeletons worn by people who lost the use of their limbs. The team plans to test that capability next year in a clinical trial with individuals at two hospitals in Australia who suffered traumatic spinal cord injuries. Oxley, Opie, and colleagues from University of Melbourne tell more about stentrodes in the following video.